Jonah Mowry posted this video of himself about his fear and despair at the thought of starting 8th grade, because of the severe bullying he has experienced since 1st grade … and he started cutting himself in 2nd grade. At some point – at several points – during the ensuing seven years, he has contemplated suicide. Jonah was fortunate to get a positive response to his video, and the kids at his school responded by befriending rather than more bullying. I am exceedingly happy for him that he’s got some friends now, that he garnered good feedback and his bullies realized what they were doing. Why did his parents send him back to school? I do not mean to imply that Jonah’s parents didn’t care or weren’t aware of what was happening to their son. I will work from the assumption that they knew and that they were trying their hardest to find the best help available for him both at the school and outside the school. But knowing that this is not a one-time scenario, that this is happening every day to children all over this country, I have to wonder how it is that so many of us have bought into the idea that keeping these bullied children in school is the most important factor to consider in this equation? How has the institutional school system so brainwashed us all that we have reached a point where it is more important for a child to learn to add and subtract than it is to protect him from this sort of animalistic behavior? How can we – we parents, we teachers, we school bureaucrats – think that it is okay for him to despise himself, his life, and his peers, as long as he can diagram a sentence properly? I’m filing this in the “Stupid School Tricks” category because this does not happen anywhere except in school (and if the school does nothing to promote it, it certainly does very little of real impact to stop it). If this were happening to your child anywhere else – anywhere else: church, the YMCA, the park – you would stop it. You would talk to the Sunday School teacher or church board or just change churches. You would go to the Y at a different time, or find another place to work out. You would stay inside, or go to the park only when the bullies were in school. You would find options. You would protect your child. And yet, when a child is bullied to the point of self-mutilation and thoughts of suicide, rarely is the first thought of pulling him out of school. Nor the second, third, or fifty-second thought. It’s just not on the table. Parents, I know you are trying to help and protect your child, but you are thinking inside of a square whose lines have been drawn for you by people with a vested interest in keeping your child in school. I admit I do wish that more parents would simply realize that removing school from the equation is a viable option, but I realize that they will not. They can’t think outside of that square because they don’t even realize the square is there, hemming them in. So what outrages me is not so much the parents as it is the system that drew us into the square and has us all brainwashed into thinking that no matter how bad it is inside the square for your kid, leaving the square – leaving school – is worse. Just think: a whole bureaucratic system with a vested interest in keeping your child in school, no matter how bad it is for him there. How bad must it be when a bullied population has as its slogan “It Gets Better”? That is an awful sentiment! “Stick it out, kid, because someday you won’t be bullied any more.” How about not being bullied now, in the formative and most tender years? How about protecting our kids? NO, he doesn’t. Pulling him out of school and teaching him nothing would be a step in the right direction, would help him turn out to be a better person than letting him live through this sort of agony day in and day out and realizing that, to his parents and teachers, his mental state is of less importance than the fact that he must be educated so he can “make something of himself” at some hazy future date. How about helping him make something of himself right now, instead? How about helping him make himself into a whole person? There are options. There are always options. One counselor might say, “Stick it out, it gets better.” Another counselor might say, “This other school is better, try it out.” But if your child is at this point, I have to say I think finding another counselor or switching schools is like rearranging the deck chairs on the Titanic. Parents of bullied children: I know you want to help. I know are trying to help. But moving his chair to the sunny side of the deck doesn’t change the fact that his ship is going down. Be brave for your child. Be brave with your child. Try something different. Bring him home. Bring him to the safest place on earth for him, and let him heal. Severe bullying is an excellent reason to try homeschooling. Think of it this way: even the schools are saying, “it gets better once they’re out of school.” Listen to them and take those words to heart. Get your child out of school now. Homeschooling is not the only option, but it is a good option to take into consideration. I know single parents who make homeschooling work. I know two-working-parent families who make homeschooling work, or who find a way for one parent to quit and be home with the kids. I know homeschooling families who use grandparents or neighbors or friends from church who can be with the child during the day if he’s too young to stay alone. I know homeschool parents who need a little extra income and will sit for and teach the child of working parents, taking him to homeschool group meetings where he can make friends who won’t bully him. No, homeschooled kids aren’t perfect, and of course there is some teasing, but that level of bullying just doesn’t happen in homeschool circles. It can’t. No homeschool parent would stand for it. The homeschooling parent already pulled her kid out of school; she isn’t going to hesitate to pull him out of a bad situation with a homeschool group. And you shouldn’t hesitate to step outside the lines drawn and enforced by the institutional system, and pull your child out of a bad situation at school. It won’t be the worst thing in the world. Instead, it might be the best thing you ever do. P.S. to the parents of the bullies: I’m talking to you too. Do you want to stop your child’s bullying behavior? Take him out of the situation that gives him that power, or that environment that makes him feel he needs to assert power over other children. Let him start living a real life without fear, which is often what prompts that types of behavior. Let him be safe too. Does Homeschooling Prepare Students for the Real World? 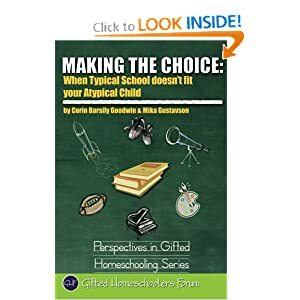 Making the Choice: When Typical School Doesn’t Fit Your Atypical Child by Corin Barsily Goodwin and Mika Gustavson: A look at the perceived barriers to homeschooling for children who don’t “fit” traditional schools, and how to find educational options that fully address your child’s academic and emotional needs. I agree whith waht you said. The child is or should be most important. Yes Jeanette – so sad when that is not the case! Absolutely agree completely. Parents are terrified that they can’t do it, that they aren’t qualified, that the schools are trained and so they will do better – I’m a former PS educator and I’m here to say that the BEST teacher for any child is his or her parent. It doesn’t matter how much education you have. Learn along side him or her and facilitate as much learning as possible. You might not know calculus, but you know how to find a calc program online, you know how to phone a math friend, you know how to purchase a calc workbook. Empower your children, empower yourself. Absolutely, Missy! I may not be able to TEACH every subject my child is interested in, but I can certainly locate the resources to get him what he needs! and the post of course!!! EXCELLENT! I’ve had the same thought for years – playing video games all day long without bullying is a far better option than the emotional trauma bullied children have. I also add that all the anti-bullying programs for children in the world aren’t going to fix the problem until someone addresses the issue of TEACHERS bullying – students and each other. I saw it and experienced it in elementary school, I saw it often in my high school, and it was still happening when my oldest two were in public school when they were early elementary. Excellent, Carma. Couldn’t agree more. Thank you, Jen. I do wish we had an easier way to get the message out to parents and kids who are suffering through bullying! I appreciate that. I had a little trouble with targeting my outrage at first, but a friend who had bullied kids helped me see that my focus should be on helping the parents see they have other options. Excellent post. I homeschooled my kids as long as I could, then had to put them in public school so I could work. Broke my heart!! They came through it safe, but were exposed to things I’d rather they hadn’t been. I know the time they spent at home was instrumental in their survival skills once they were in school. Thanks for the update on Jonah. That’s been on my mind since seeing the video recently. All our kids deserve to be safe. Jo, good for you for doing what you could, when you could. I know your children were better off for it! It took me years to get over being picked on at school… it decimated my self esteem and cast a shadow over most of my childhood. parents don’t take this stuff seriously enough in my opinion. Fijawa, I’m so sorry you had to suffer that. Kudos to you for rising above it! This is terrific and so well said, thank you for writing it. As a PFLAG mom I am very aware of the abuse so many kids deal with on a daily basis. I am also a homeschooling mom and know the benefits of being able to help my kids navigate the world within a framework of safety and acceptance. Kids learn all day, every day. I want mine, and all kids, to learn they deserve to be safe and happy. Kathy, that is a wonderful thing to teach all our children! THANK YOU, Carma. I just discovered you after a friend posted this blog on FB. Common sense is so refreshing!